After spending some considerable time with Nutjitsu, I was almost trying to avoid writing an As We Play for the next Xbox One digital release. Thankfully, however, the next release turned out to be the quite brilliant Super Time Force from Capy Games. For retro fans, Super Time Force is an absolute delight on the eyes. Colourful 8-bit style visuals explode from the screen in pure unadulterated high definition glory. It’s a gorgeous looking game, make no mistake, and its art style really adds an awful lot to the overall experience. The game itself isn’t as straightforward as it first appears – a simple side-scrolling platformer or shooter this is not – Super Time Force introduces the concept, as the title suggests, of shifting time to your advantage. Thanks to the different playable characters at your disposal, the mechanics on offer here almost allow you to play cooperatively by yourself. While that may make no sense at all, play a few levels and it’ll all suddenly just click. As you plod through the level, you’ll be able to rewind time at any point with the push of a button. When you stop rewinding, you spawn a new character whilst your previous incarnation ghosts your previous actions. Whilst this might seem like a novelty, careful execution is critical in later levels when you simply don’t have enough time to take out a boss and need to “spawn” multiple characters for extra firepower. If you die, then you also need to use a rewind to continue through the level – if you can avoid the death by taking out the enemy beforehand, then you get an extra hit credited to you. Think of the rewinds as your lives. You start each level with about 30 and after you’ve used them all, one more death and it’s game over. It’s a nice game mechanic and it does generally work really well, however I did feel on occasions that the game gave you little in the way of a break. Sometimes you just want to enjoy the level design, but instead you’re always thinking about when you need to rewind and respawn. It keeps you on your toes, that’s for sure. Once your brain gets over the fact that this isn’t going to be a walk in the park, the way in which you approach each level dramatically changes. No longer do you wonder how you’re going to beat this boss with only 5 seconds left on the timer, you start wondering how many dudes you need to wipe him out. It’s the closest I’ve ever got to being mentally exhausted after playing a game! When I’m evaluating a game’s level design, my automatic comparison is always one of the many Nintendo offerings. 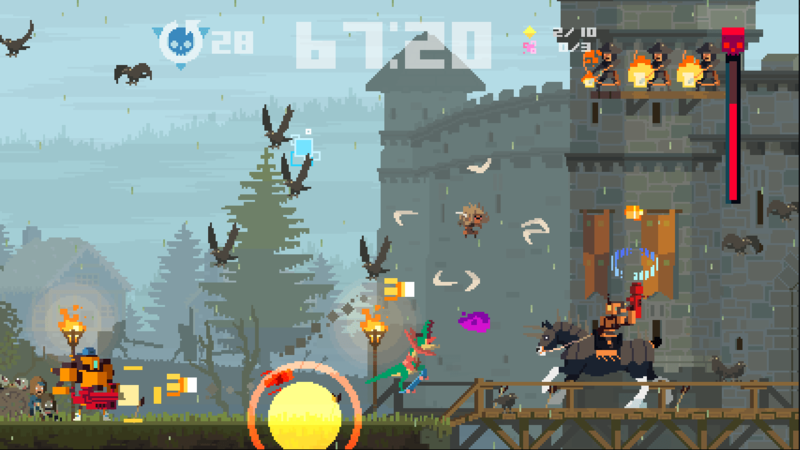 Super Time Force excels with a wide range of locations, some complex but not frustratingly so areas. Whilst there is a natural reliance on the rewind mechanics, they don’t overshadow brilliantly designed levels which wouldn’t look out of place in a more traditional platformer. The game itself is pretty huge and will take the average gamer a considerable amount of hours to get through it all. Each protagonist plays in a very different way with their different weapons and moves, so in theory there are a number of different ways to complete each level and plenty of replay opportunities. Part of the fun is retrying over and over, taking each lesson learned into account each time. 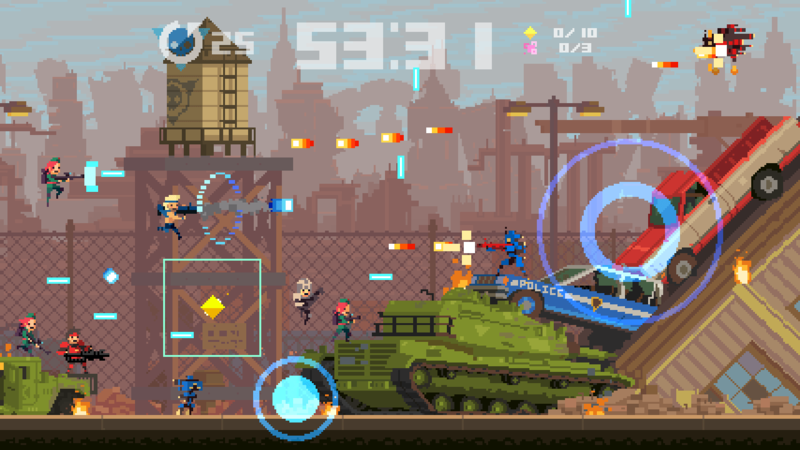 When you factor in the modest £11.99 price tag, Super Time Force quickly becomes exceptional value for money. At the end of each level, you’re treated to a full-length replay of your accomplishments – the perfect way to reevaluate your strategy if it’s a place on the high-score leaderboards that you’re after. If you’ve got friends also playing the game, the ability to share these replays is also a great method of rubbing their nose in it once you’ve beaten their score. Super Time Force is a refreshing take on an exhausted genre. You’ll come for the awesome retro art and you’ll stay for a game that plays like no other around. It’s a challenge, but never does it feel like one you won’t overcome. It’s not a game that you’ll play for hours on end in one sitting, but it’s the perfect antidote following a mindless FPS evening. Snap this up in a heartbeat.